Where are all my country music fans out there? I guess I haven’t really exposed it yet on the blog, but if we’re friends on Spotify, you’ll probably start to question why I have Carrie, Miranda, Eric Church, and Thomas Rhett on repeat. So obviously, I got really excited last week as I was driving Clarence to daycare, listening to the big Z100 pop music station because the new country station is really fuzzy in my old Jetta, and it sounded like they were interviewing Thomas Rhett. You know, the voice behind “Happy Man“, that they’ve been playing across all genres of radio stations, if you still listen to real radio? I was so intrigued, I immediately went home and stalker Googled a picture of his wife, because he sounds like the absolute sweetest southern man ever. In the interview, he talked about not going along with stereotypes or getting shoved into the country box, explaining that he’s never one for trends. If it’s cool, he either liked it two years ago or won’t like it for another two years. It always validates my resistance to trends, like soba noodle bowls, when I hear something like this, whether it comes from an awesome country singer or not. I’ve seen all the noodles circulating online for the last couple years, like the ones from Dennis, who, I think, is or was really into noodles. I don’t know exactly…I unfollowed his Instagram. While his photos are beautiful and he is, in all seriousness, so talented with a very original style, and I occasionally do still hop over to take a peek, it was a little too much meat for my feed. And also I like to buck the system, so when everyone else started following him, I obviously had to stop. All I’m doing in this post so far is talking about bearded men, though. Let’s get (closer) to the point. Sometime before my wedding, Maria, the best live yoga teacher I’ve ever had, gifted me Heidi Swanson’s Super Natural Cooking. That’s right. She just straight up brought a brand new copy to class and gave it to me. Steve pointed out that I did, in fact, pay many dollars in class fees, but that’s beside the point. Maria is one of the kindest, most gentle people I have ever encountered and she gave me that book for a reason, which was clearly so that I could be convinced once and for all of the superiority of soba noodles over any other variety of pasta. Yes, the trendy soba noodles that I’d been shunning, but that Ms. Swanson published in a 2007 cookbook. She was ahead of the trend; I’m way behind. 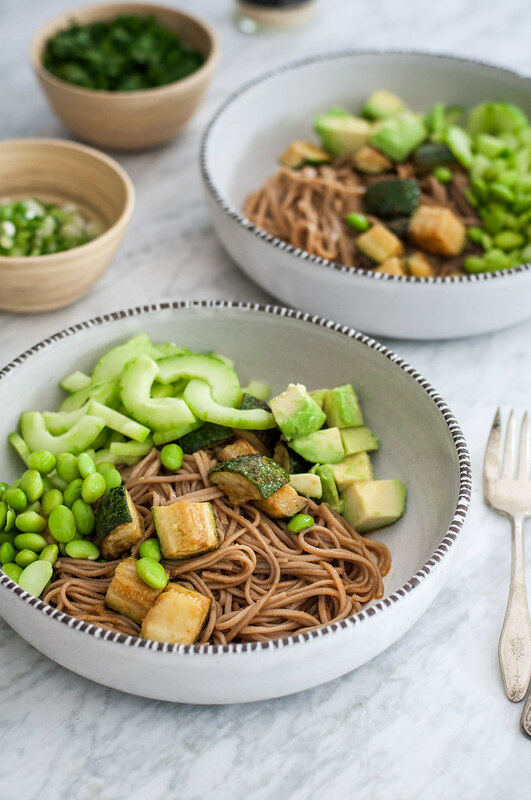 If you’re like me and haven’t previously considered soba noodles, here’s what you need to know: they cook in 3 minutes flat, you can buy 4 organic servings of them for under $3, they’re whole wheat and healthy, but, just to be honest, they’re not gluten free. Since a large serving of noodles contains around 200 calories, I don’t get too hungup on the gluten thing in this case. Instead, I just load them up with every green, fresh veggie I have in my fridge and mix them with an Asian-inspired homemade dressing, for which you probably have most of the ingredients in your pantry or fridge at this very moment. Soy sauce, limes, garlic, olive oil, cayenne pepper. Plus a few others that will serve you well for months to come. Like Trader Joe’s toasted sesame oil, one of my favorite “secret” ingredients. Ever since I retired from a 9 to 5 office job, there’s one little thing I miss. My last couple gigs included lunch orders from Seamless, and there is nothing better than cheap takeout Asian food at lunch. Sushi, noodles, fried rice, stir fry–I love them all. But they’re not the easiest thing to whip up at home, if you’re looking for that restaurant flavor. Until now. This is not a halfway version of Asian noodles that you make yourself and kind of like to eat but wish you had takeout. They are the real deal, in that you will be looking forward to lunch all morning or even sneaking a bite when you go make your third coffee at 10 AM. 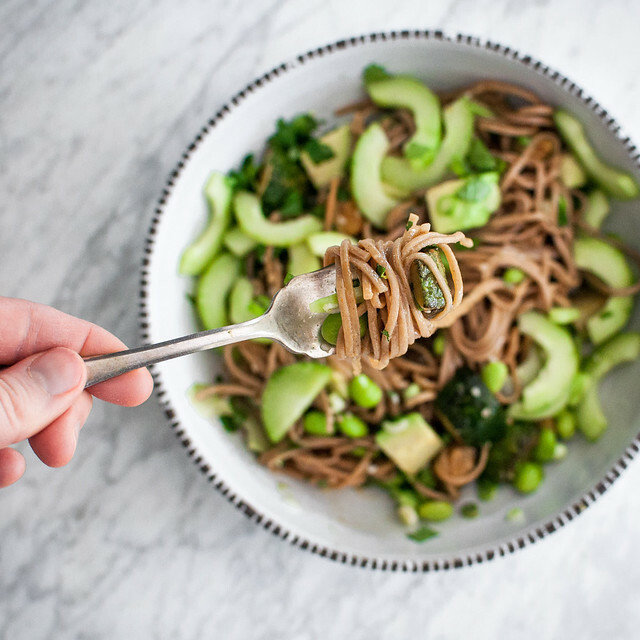 Make the full recipe on Sunday, and you’ll have cute little soba noodle lunch bowls for four days, leaving you room to change it up on Friday or if you get bored mid-week. You best label those containers, though, because if it’s see through and someone spots your lunch goods, who knows, they might be overcome by temptation and run off with it. Things I don’t miss about working in an office: lunch thieves. 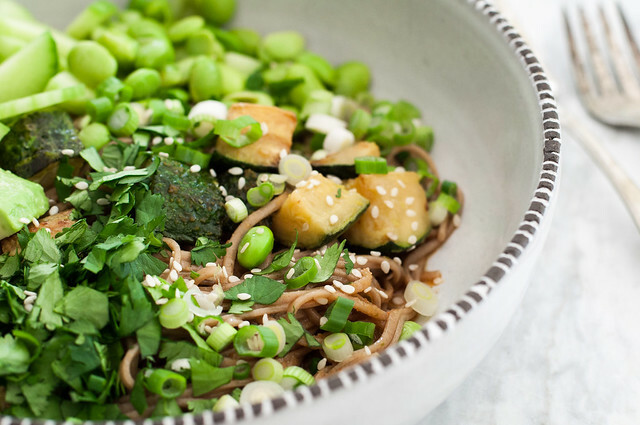 Even though it’s likely the dead of winter where you are, sometimes it’s worth it to spring (no pun intended) for an out-of-season ingredient or two to whip up a noodle bowl that will transport you to warmer months. If you really want to keep it local, skip the summer squash and cucumbers and go for some winter squash or hearty greens–it won’t ruin the fresh Asian noodle bowl vibes. Then, when summer does finally show its face, you can make a double batch of these noodles for the first potluck of the season, maybe Memorial Day, and everyone will devour it, because it looks and is healthy and it’s about to be swimsuit season, a hard fact I choose to avoid for now by donning sweats and fuzzy Patagonia fleeces daily, just like I am right now. I went directly to Whole Foods for soba noodles, and even my moderate sized location carries many varieties at lots of price points. However, you should be able to find them at any grocery store with a decent Asian foods sections, or, of course, at a speciality Asian foods store. If all else fails, find them on Amazon. I’ve tried this brand with great results. 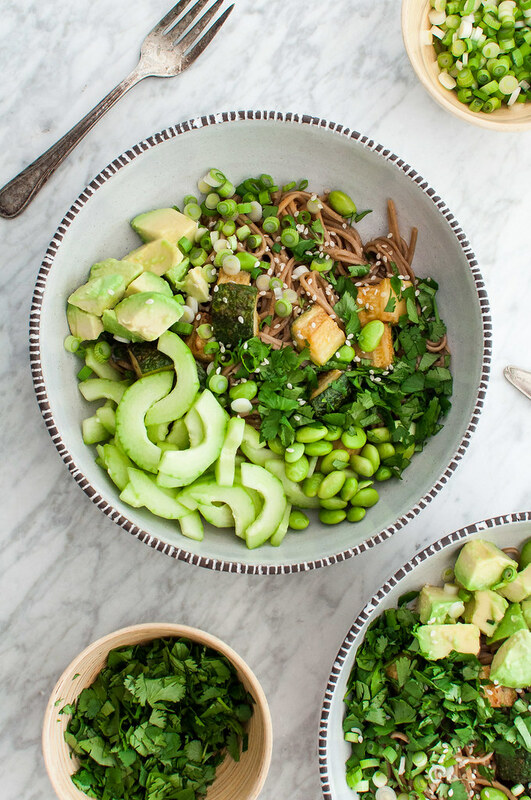 Make ahead noodle bowls that will have you counting down until lunchtime. "Accidentally" vegan, each bowl is full of healthy fat, protein, veggies, and, most importantly, flavor. 2 medium zucchini, diced ¾"
Make the dressing first. 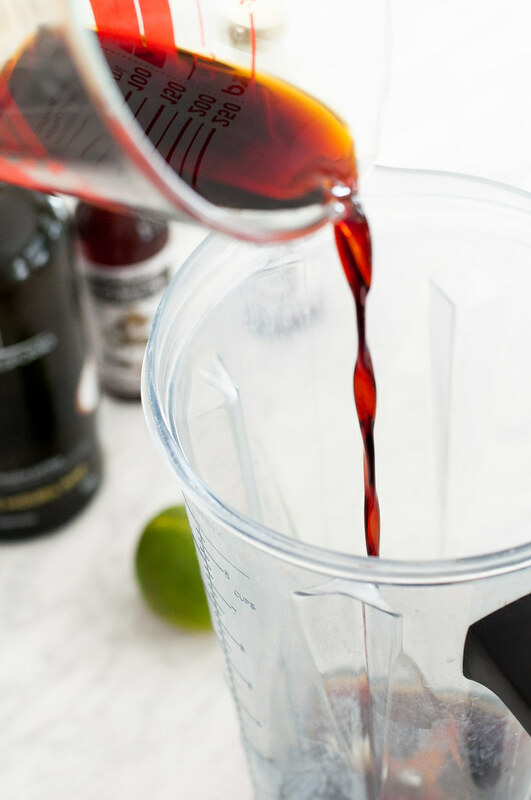 Combine all ingredients except both oils in a blender and blend until smooth. With blender running, drizzle in both types of oil until emulsified. Set aside or refrigerate until ready to use. 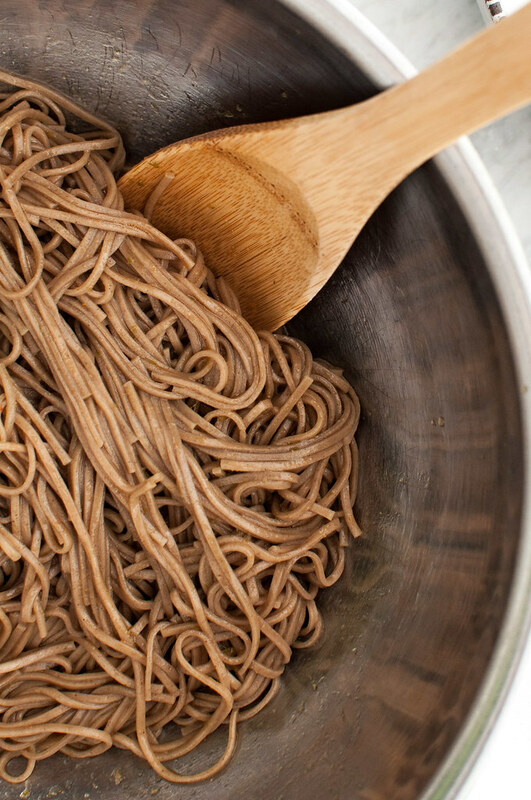 Bring a large pot of water to a boil, then add soba noodles and cook for about 3 minutes, until just tender. Drain and rinse with cold water. Place noodles in a mixing bowl and toss with ½ cup of the dressing, then distribute amongst four serving bowls or storage containers. 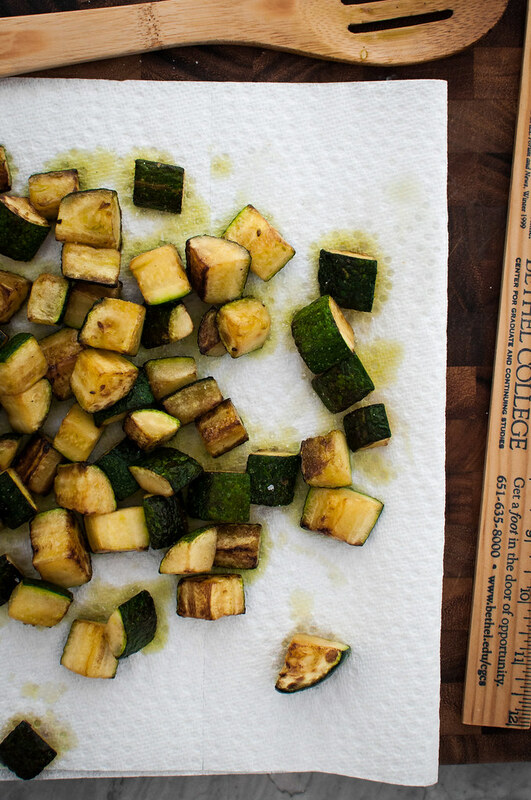 Heat the coconut oil over medium high in a skillet, then add zucchini. Cook in a single layer, stirring infrequently at first, until mostly browned, about 8 minutes. Halve the cucumber lengthwise and slice thin. Place an equal quantity of zucchini and sliced cucumber over each bowl of noodles and spoon remaining dressing directly over them. 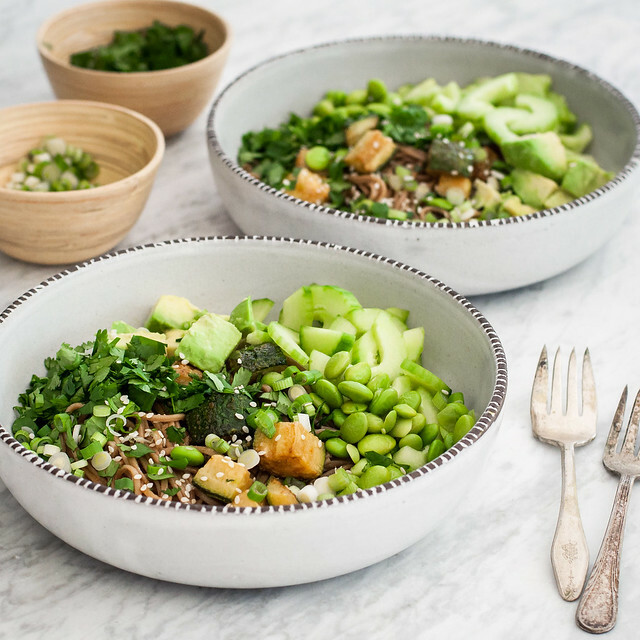 Add cilantro, scallions, avocado, and edamame to bowls, mix everything together, and sprinkle with sesame seeds. 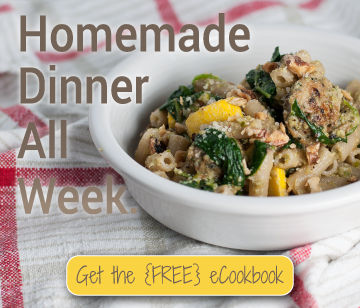 If avocado is stored separately, the dressed noodles keep will in the fridge all week and are yummy served cold or room temperature (several of the veggies and cilantro do not heat well). 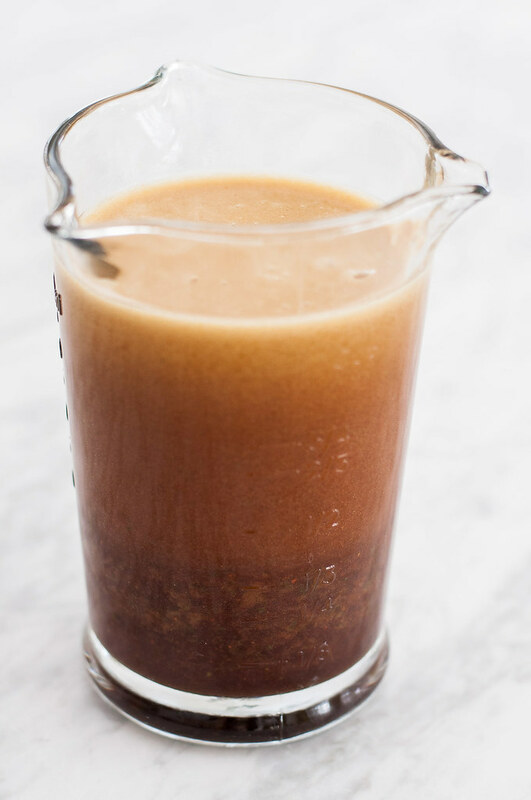 The dressing has a bit of kick with a half teaspoon cayenne. If you don't like a lot of spice, reduce to you liking. To make this bowl even greener, throw in a handful of finely chopped greens like spinach, kale, or whatever is in season. Dressing recipe adapted from Otsu recipe in Heidi Swanson's Super Natural Cooking. Yes! I knew I would find someone. Love them!